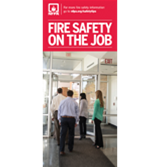 Make easy work of educating the workplace about fire safety with NFPA®'s new Fire Safety on the Job Brochures! Five ways to prevent fires at work. How to fix fire hazards. Seven ways to be prepared in the event of a fire emergency. Essential steps to take if you work in a high-rise building. One essential number to always have by the phone. Turn off appliances and unplug them after workers leave. Smoke in designated areas only. Report damaged electrical cords to building maintenance. Know the sound of the building's alarm—and how to escape from every area of the building.